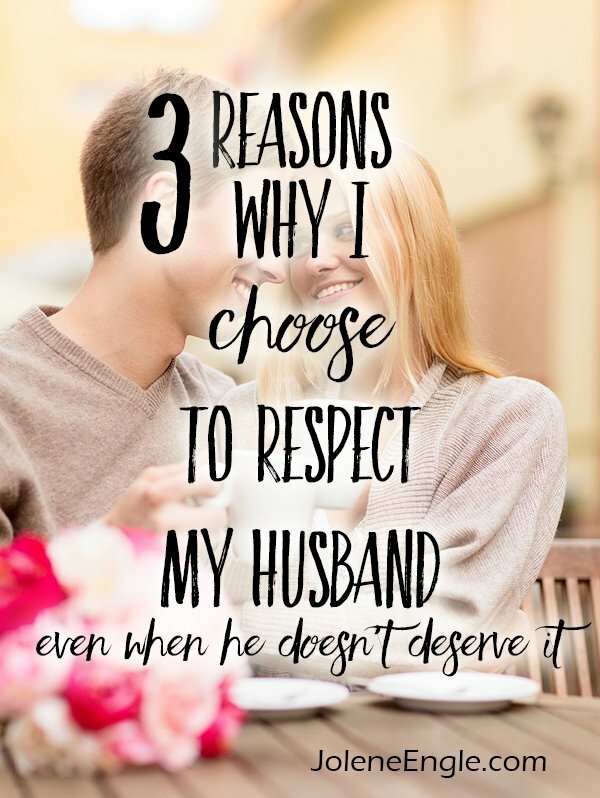 3 Reasons Why I Choose to Respect My Husband Even When He Doesn't Deserve It! I choose to respect you for three reasons. Because the Bible commands me to, and who am I to argue with God. But God placed that command in Ephesians 5:33 because it protects our marital oneness; it provides us with what we need from one another. And when both husband and wife seek to obey these commands, our marriages become God-centered, God-fearing, God-honoring, and not to mention, absolutely amazing! A God-fearing marriage is a true testimony of Christ-like love to a dark and lost world. When your marriage is like that, your life is representing Christ and the Church! That God of ours is a pretty smart God! If only we had half a brain to listen to Him all the time! Because I need to respect you and you need my respect. I proceeded to tell my Beloved about a little switch that I have in my brain. Now, I’m not sure if all wives have a switch like this, but I sure do. I do my best to fiercely protect it because I know what will happen to me if it gets flipped! If the switch gets flipped and I stop viewing my husband with respect and admiration, then my marital relationship would shortly turn into a platonic relationship because I wouldn’t want to be intimate with my man. (Um, yeah, I just said that!
) If this takes place, we will be just two people living under the same roof, parenting together, but going through life like mere roommates. That’s not the type of marriage I want to settle for, nor is it the type of marriage that God intended. And if my marital relationship turns into a platonic relationship, then it’ll be easier for me to be unforgiving and bitter towards my husband. If I continue down this path, my heart would harden towards him and my marriage would be a poor reflection of the love that Christ has towards the Church. In essence, I’d be blaspheming the Word of God if I took this approach in my life. Because I’m a selfish individual. I want a glorious marriage! Who wants their marital relationship to be blah? I don’t know any bride who said they walked down the aisle hoping to have a mediocre marriage. I choose to respect my man whether he deserves it or not. And it just so happens that this one intentional act causes him to want to be a better husband. It’s a win-win for both of us! Now let me just say that taking this intentional approach to your marriage will kill you. Yes, kill you! Your flesh will not like it one bit. In fact, it’ll feel like a part of you is dying inside. And you’re right, my friend, it is! Our natural self-centered and pride-infested tendencies will be screaming ‘no-fair’ and ‘no-way’. But push through those feelings with the strength of the Holy Spirit. If you keep continuing in these ways, respecting your man on a regular basis will become much easier and you’ll come to embrace it. If you struggle with respecting your man or you’ve become complacent in this pursuit, implement as many ways as you can listed below. Be more concerned with your walk with the Lord, rather than your husband’s. You are his wife, not his Holy Spirit. Continue to build him up rather than tear him down. You’ll create a lot of peace in your home by doing this. Share your heart with him. Become best friends. Ask him about his day. Take up a hobby with him. Put more effort into your role as a wife, than your role as a mom. Remember, the marital relationship came before motherhood. It’s easy to nag, condemn and criticize. When you feel the tendency to speak like this, instead, do the opposite. Speak loving, encouraging, and uplifting words into his life. If you can’t do this then just bite your tongue. Forgive him like Christ has forgiven you. Keep the right perspective. Remember that you’re a sinner too! The two of you are one. So if he’s broken, hurting, insecure, etc. guess what? You are too! If you’ve already lost respect for your husband, join me here where I’ll teach you how to regain it so you can receive the love you desire! « Why Following the Lord Can Bring Me to Tears…& a Link Up! Thank you Jolene for the Linkup and thank you for always sharing posts that encourage me in my marriage. It is always so beneficial. You are so real!! Hello Jolene, I wanted to introduce myself to you, and to say hello. follow Christ. And that you hear His voice! It gives me great hope. I have been teaching women to love their husbands for years. the class any longer. More one one one with the ladies the Lord brings my way. I look forward to reading more post and Linking up as the Lord leads me. I chose to respect and trust my husband and when that happened our marriage changed – It was amazing what happens when we listen to and obey the Father. Bless You! What a wonderful testimony of your obedience and God’s faithfulness! As usual, your posts are well-thought out and very helpful! Thank you! Thanks to Lord that I have read your article today, it’s very helpful and encouraging. Thank you. What do you fo if you find yourself in a “roommate” type relationship with your husband? Together for 10years and sadly he is emotionally abusive. I have fought tooth and nail to keep our marriage going, but I also realized I cannot do this on my own. I am the main bread winner and I have always encouraged him to be more positive with himself, only no voice goes unheard. Over the past 3months I brought this into convo about the pain and hurt I’ve felt. Everythings seems to go well for awile, but then he’s back to his hurtfu, controlling ways. Sorry to hear about your situation, Jess. Pray for your husband’s heart to soften towards the Lord. When God has access to anyone’s heart, a transformation will take place. Prayer is essential for a transformation in one’s life. Continue to please the Lord with your walk regardless of how your husband is responding. Jolene, I thank the Lord for your blessed posts. My heart hurts so badly over who I have become. The Lord is using your posts greatly but it’s bern a major battle for me. This post in particular really describes me. If you think about it, would you please pray for me? I’m hoping to purchase your study before midnight tonight too. Thank you! God bless! Hi Jolene, I find that the circumstances in which one is is very different. I am a mother of five children. Four are in the teens and the youngest is only four years old. We both are earning. But my husband is a miserly person. I find him difficult to respect. We constantly argue regarding our children’s education. He would not allow me to tithe or help anyone. I bear all our children’s education and keep our home running where as he says he saves money for security. Which he is unwilling to spend even for my operation. Since this year he has given me some money for our eldest daughter’s education after lots of argument and threatening him for a divorce. As a Christian women I feel that I have to keep the family United. I have lost all respect in my husband. I’ve been so blessed by your website. You have been speaking to my heart. Please keep doing what you are doing, I know sometimes it might be discouraging but I tell you there are women out there that will truly be blessed. My husband and I have been married for 14 years now and still believing God to bless us with children. During this time, he has cheated on me and done things that made me loose my respect for him and all these has affected our marriage. What do I do?